If you need to see a doctor in the evening we are now opening late on alternate Monday and Thursday evenings at our Charles Hicks Centre in Huntingdon and at the Roman Gate Surgery in Godmanchester. Contact your respective surgery to see which evening that they will be open. If you require a doctor urgently when the surgery is closed please telephone NHS111 by dialing 111. In the event of severe chest pain, breathlessness, collapse or heavy bleeding it is often best not to delay but dial '999' for an ambulance. It is also best to go to casualty in cases of poisoning (including overdose) or accidents. They will ask questions to assess the symptoms, and give healthcare advice or direct the caller to a local NHS service. If necessary they can also call an ambulance or direct people straight to A&E. 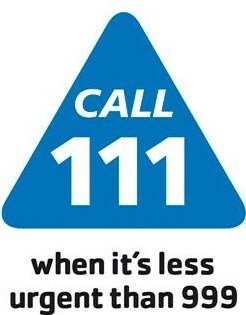 Calls to NHS 111 are free from a landline or mobile phone. Pharmacies are open across the area during Easter; some are even open on Easter Sunday. Pharmacies can help with a range of things including aches, hangovers, colds, emergency contraception, and non-prescription medication. Opening times for pharmacies can be found HERE or you can dial 111. There is a new First Response Service (FRS) in Cambridgeshire and Peterborough which gives those in mental health crisis the opportunity to get access to help quickly, by calling NHS 111 and selecting option 2. The new service allows patients or carers to speak to specially-trained mental health staff who can provide advice, support, and signposting to other services. The service is available 24/7, 365 days a year.